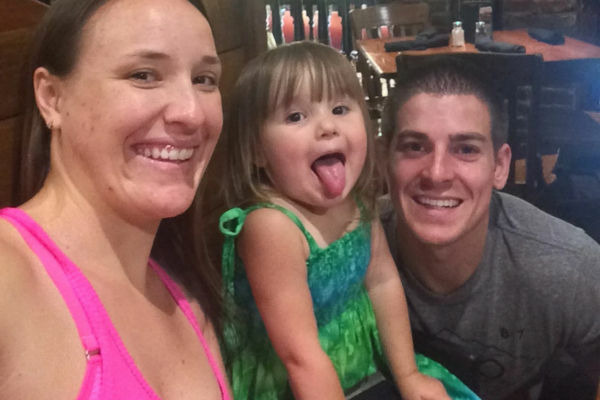 In August, at 23 weeks pregnant, Emily Morgan stepped aboard a cruise ship, with her husband and excited three-year-old daughter. Her doctor had rubber stamped the trip – after all, she wasn’t due until December. But just two days into the week-long Royal Caribbean jaunt, things went horribly wrong. Her tiny baby was coming, and they were 14 hours from the nearest hospital. What happened next was incredible. When Emily started to feel mild contractions on their second day at sea, she and her husband Chase, weren’t too concerned. As this was their second child, they were well aware of Braxton Hicks. But as time ticked on, the contractions didn’t ease. And after four hours, Emily began bleeding. “I knew something was wrong, but I didn’t really comprehend how wrong. I didn’t think about what the possibilities were. All I knew was I was going to have a baby,” she told The Washington Post. When she was examined in the ship’s medical centre, a nurse and doctor told Emily she was in labour. She was warned the ship wasn’t equipped to deal with such a premature baby. 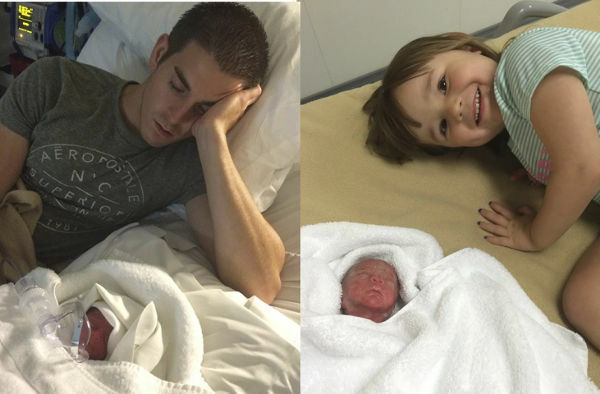 Emily gave birth to baby Haiden an hour later, on September 1. He was taken away by the doctor, as medical staff tried to stem Emily’s blood loss. Incredibly, doctors informed Emily and Chase that their son was alive – but struggling. He was wrapped in towels, with an oxygen mask on his tiny face. He weighed just 680 grams – little more than a jar of bolognese sauce. The couple refused to believe that their son wouldn’t survive the night. 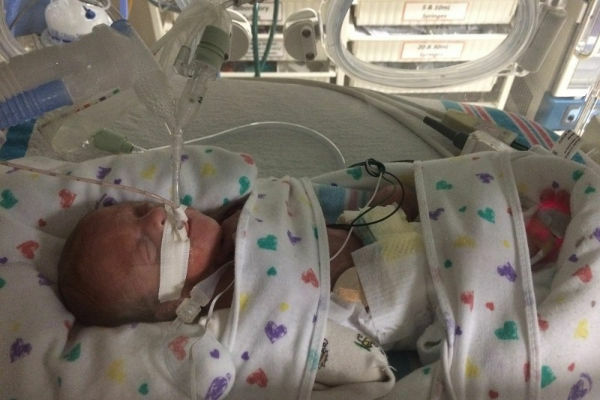 As any parents would, the Morgans spent the night fighting to keep their baby alive. When the towels he was swaddled in were wet, they replaced them with dry ones. They put sanitary pads on his head so he didn’t lose too much heat. Emily microwaved saline pouches every hour and a half to place next to Haiden to keep him warm. That morning the captain of the ship was surprised to find the baby was alive, as the ship steamed towards the nearest port – Puetro Rico. But that extra two hours would prove crucial. 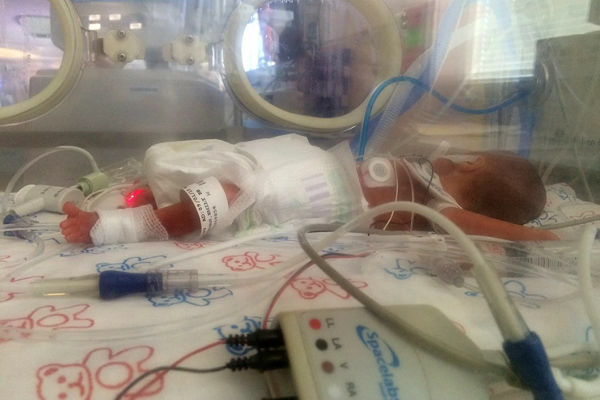 Baby Haiden developed signs of hypothermia, and he desperately needed to be placed inside an incubator. Once the ship docked, Haiden was taken to hospital, and the family followed soon after. 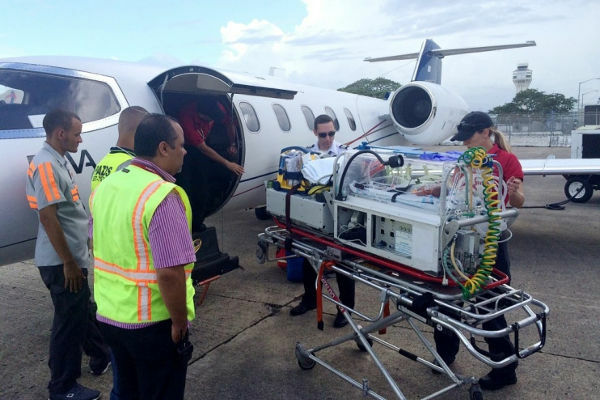 Three days in a neonatal intensive care unit was enough to stabilise Haiden, and he was transferred to a Miami hospital. And that’s where he remains. According to the family’s gofundme page, which is raising money for medical expenses, Haiden is dealing with a small heart murmur. He is having just two tablespoons of milk every three hours. “He gets the milk through a tube that is in his stomach, the nurses also give him a cotton swab of milk on his mouth/lips which he will clamp down on. He is slowly gaining weight but he is still only at 1lb. 9oz (860g). He loves to sleep on his stomach, he hasn’t gotten to sleep on his stomach lately since he had to have the respirator tube put back in to assist him with breathing, ” Emily writes. Incredibly the family is able to look at the experience in a positive light.